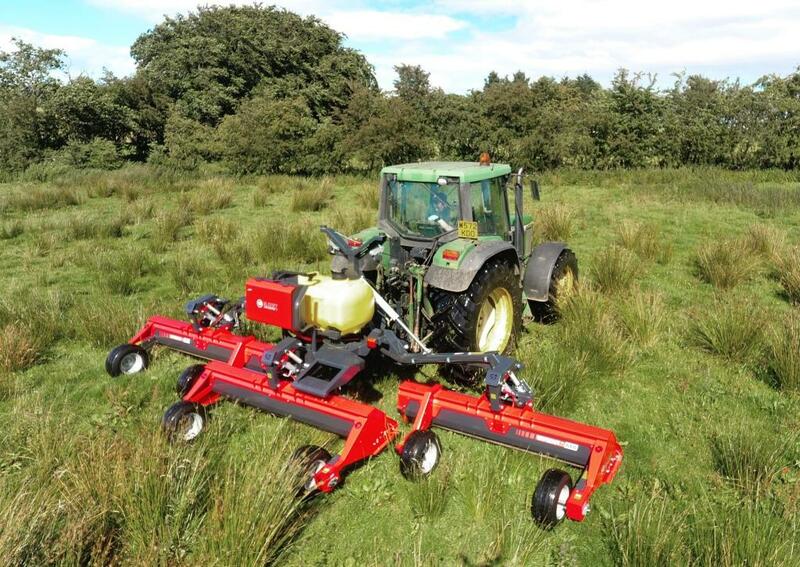 UK machinery manufacturers Blaney Agri offer a range of innovative weed control machinery for use with tractors, ATVs and UTVs including sprayers and advanced weed wipers. Blaney Agri has developed an innovative range of tractor mounted wipers offering contact widths of 3m, 4.5m, 5.7m, and 6.6m. The tractor-mounted wipers are equipped with innovative highly absorbent fibre dual rollers to ensure superb chemical retention on the surface and for excellent application to weeds for effective and efficient weed kill. In clumps of weeds, the twin rollers rotate in different directions to separate the weeds to apply more chemical up each individual stem giving faster weed kill rates. The second roller also acts as a reservoir to absorb any excess chemical that may be on the primary roller, to minimise the risk of dripping which can cause grass/crops to burn. Although mounted to the three-point linkage, the tractor wipers are still ground driven to ensure each section follows the contours of the ground independently for maximum weed kill. The wider models have been developed for easy road transport with an innovative fold-up design. Each section can be manipulated individually via fully electronic in-cab controls, to follow the ground contours easily. The Blaney Agri range of TGS Grassland Sprayers offers the farming community a sprayer (400L- 1200L) that will outperform any cheap Eastern European import and compete favourably on price with established brands. The Blaney TGS sprayer range is equipped with high specification pumps and a high-performance control system. The deluxe booms have been cleverly designed to protect the nozzles from accidental damage and to avoid additional calibration requirements. This design also incorporates an anti-drift function by protecting the exit point of the nozzle for a more accurate and efficient spray pattern. As with all Blaney booms, these deluxe models are equipped with a breakaway in both directions, with an auto reset function in case of collision with an obstacle. The boom design allows for adjustable height and angle settings of the outer sections. This helps protect your investment by allowing you to make adjustments to keep within the boundaries of the new test regulations where little allowance is given for errors in alignment. Contact Blaney Agri to find your nearest dealer and find out more about their innovative machinery, designed and made in Co Antrim,UK. Call the team on 028 2587 2801 or visit www.blaneyagri.com.